Sunday Post columnist June Field has caused quite a stir in the small Angus town of Carnoustie. 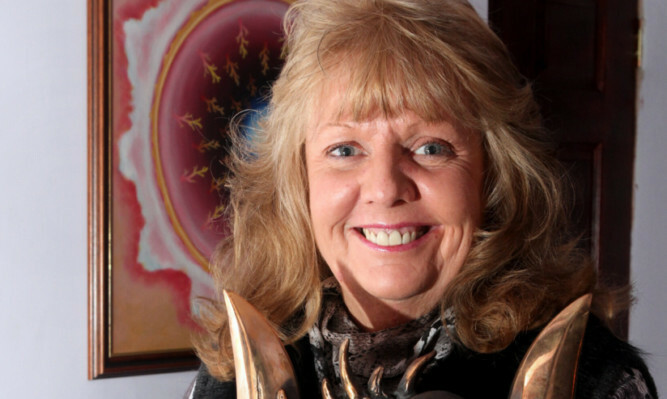 The official World’s Greatest Psychic has agreed to conduct readings for only £20 as part of a charity event this Saturday and these have proved very popular. Very, very popular! The event, Party@Pitskelly, has been organised by Carnoustie Panmure Youth Football Club to raise money for a new 3G sports pitch. Entry will be free but with a host of live bands playing, as well as stalls, bouncy castles, a beer tent and various other attractions, the club hopes to raise several thousand pounds. But when it was announced that June, who won the title of World’s Greatest Psychic in a gruelling competition in Ukraine, was to give readings for only £20, it all moved up to a different level. Dean McConnachie, chairman of the organising committee, said: “We were very pleased when June promised to come along to our event, but we didn’t realise how popular she was. “We’ve been inundated with people wanting one of the 15-minute slots with her. People have contacted us from all over Scotland looking for a reading. “Some even say they will be coming along just hoping that being near June will attract the spirits of their loved ones who have passed on. Dean and his organising committee have decided to hold back two 15-minute slots with June and auction them on the day. The event is shaping up to be one of the biggest things ever to take place in Carnoustie apart from the small matter of The Open that visits every seven years or so. June regularly undertakes sold-out tours in the UK and around the world. She has contacted spirits on behalf of many celebrities and even politicians.